Ah.. Summer produce. Gotta love that it’s now blueberry season. My Dad dropped off these wonderful fresh picked organic blueberries. 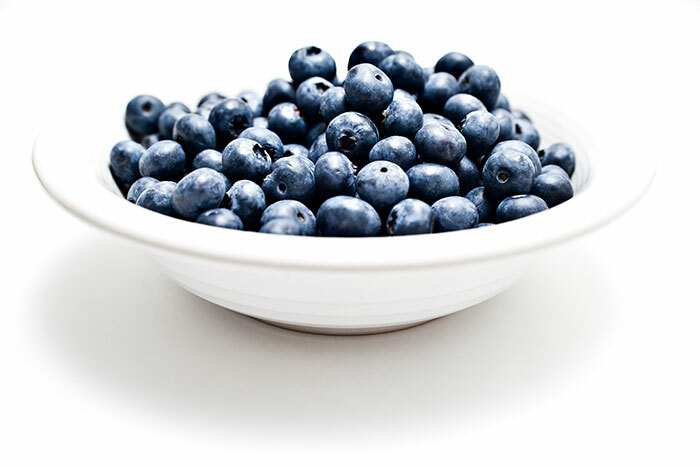 Research has shown that blueberries are extremely good for you with researchers indicating blueberries can help inhibit certain cancer, Alzheimer’s, lowering cholesterol and aiding memory. I think it is safe to say that including blueberries in your diet is a good thing. Every year we buy blueberries and then freeze them for the winter. Last year we bought a total of 50 pounds of blueberries and enjoyed them all winter long. For this photo I used a single flash and bounced it off the ceiling. This provided a nice even light. @Joel – LOL! I’ll start posting more beverages to go along with the food. The full meal deal just for you.